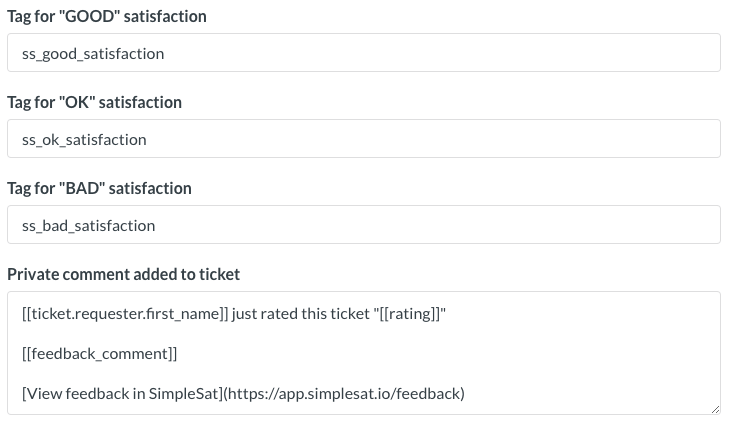 Although the integrations below are not required to collect satisfaction feedback from tickets, we still recommend setting them up so you can take full advantage of Zendesk's ticket workflows and business rules. 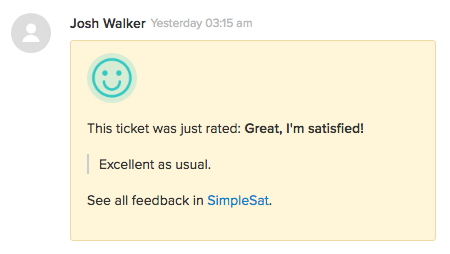 Simplesat can update the support ticket with a private comment and tag after a customer submits feedback. To set this up, click the Authenticate Agent with Zendesk button and enter your API information. Here's how to generate an API token. Once authenticated, the integration will be active with the defaults below. You can still take advantage of Zendesk's core satisfaction ratings by creating a "fake" end-user account and authenticating with it in Simplesat. Once you do, that account will update ticket ratings and then switch back to the original requester. To set this up, you first need to have a "fake" end-user in your Zendesk account. Here's how to create a Zendesk end-user and collect the information you need to authenticate. Once you've done so, click the Authenticate End-user with Zendesk button and enter the required information. Note: Because Zendesk only has "Good" and "Bad" options in their core satisfaction system, "Neutral" ratings are saved as "Bad".